Plain Flat Grating solutions offered by us are precision designed and developed so as to provide way to easy course under a planned drainage system. As these feature flat grate frame, these gratings also help in excluding garbage, debris as well as other waste materials from entering the drainage system. Plain Flat Grating solutions offered by us are precision designed and developed so as to provide way to easy course under a planned drainage system. As these feature flat grate frame, these gratings also help in excluding garbage, debris as well as other waste materials from entering the drainage system, thus ensuring least chances of drainage being clogged. 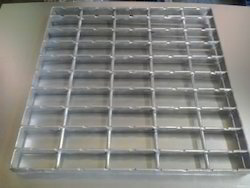 Further, these flat grate frames also find suitability in places that face heavy pedestrian traffic like in platforms or in popular high traffic walkways. Here, we can provide these in different dimension finish as well as material options as desired by the customers.